No business idea guide would be complete without having something about productivity improvement. This may not be something that automatically factors into a business plan for your small business, but it does certainly help out both in the short-term and long-term. This article is presented to ensure you get the most productivity out of your business. Check out the ideas presented and see what you can do to transform your small business. There are multiple methods for you to improve small business productivity. Listed below are all the general ways for you to do so. Take it one step at a time and slowly incorporate this for you to see the best results. Business must come first, so whatever it is that you need to do, make sure that you’ve got an eye on the tasks that need to be done. Before you do anything else, make sure you tick the most important ones off the list. Don’t give in to the temptation to ‘wing it’ at work. It is better to come up with a plan in regard to your tasks and objectives. Doing so will make your path that much clearer and allows for a greater organization of what needs to be done. Many people pride themselves in their ability to do multiple things at once. As tempting as it can be to multitask, there are also disadvantages. One would be the fact that you would be unable to concentrate fully on a single task. With your attention divided, the quality of your work would be diminished, which may lead to re-doing certain things, which in itself becomes time consuming and distracting. One valuable skill that anybody should learn is proper time management. Being involved in business makes this even more valuable due to the amount of pressure and work involved. Productivity is the by-product of this skill, which means you’ll be able to get more things done given the right amount of time dedicated to each objective or task. One way to help keep you on track is a to-do list. It can be for a daily thing, but you can also prepare weekly or monthly lists. Take note of what you need to do, when it needs to be done, and what you’ll need to do it. One thing to always keep in mind with business is to come up with goals that you can monitor and measure. In doing so, you’ll be in a better position to find ways of improving, which in turn can help you with both short-term and long-term productivity. There’s no understating the importance of good social skills. In business, this means greater success with networking and dealing with employees and partners. The better you get, the more likely it is for you to increase your productivity in certain areas. There is a certain organization to the use of social media that many tend to overlook. First among this is the fact that you can indeed schedule your posts. Find ways to do this that suits your needs perfectly. If you do this, there would be no need for you to constantly update your accounts personally and you’d be free to do other things. Do not underestimate the power of email marketing. This could be one of the things that can turn your business around. If you manage to improve your use of this tactic, then it is a guarantee that your productivity level will also soar. A lot of work goes into building your brand from the ground up. Do it right, and you will notice a lot of things going well for you as a result. This could also include greater productivity for your business. Customers will be drawn to you, revenue will rise, and you will be in a better position to accomplish your goals. The use of productivity tools is fairly common in business. Most common ones fall under categories of word processing, spreadsheets, or databases. Pick out the specific tools depending on your needs. You may want to check out multiple ones before settling on a decision, for best results. This time, we will set aside the general outlook of the business and focus on something a bit more specific, namely your accounting department. One of the things that can help you increase productivity would be the use of general accounting templates. Should you need anything else, take a look at the ideas below and gather what insight you can. You’d be hard pressed to find many people who love going to meetings. For many, these things are tedious and are even seen as useless. It doesn’t make sense to have more meetings than necessary. Do your employees a favor and don’t remove them from their daily tasks unless there is actually a good reason for a meeting. 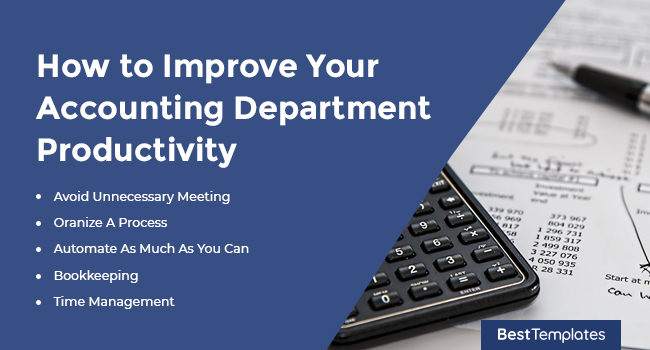 Preparing processes for your accounting department is one step forward in regards to increasing their productivity. Note that it should be simple enough to be understood properly and followed consistently. There’s no need for anything too complex, which will only prove detrimental to productivity. If you can automate something, please do so. This will take a lot of time and effort off your hands, which can free you up for other things. Just ensure that you get automation tools that you like and trust. When it comes to bookkeeping, the first thing you can ensure for greater productivity is to hire a good bookkeeper. Hire well and you lessen many problems at the start. Having the right software and tools will also ensure greater productivity, as will setting up the right processes for the bookkeeper to follow. Also make sure to get the right bookkeeping agreement template. Time management here is just as important as it is anywhere. Due to the amount of work involved and its importance to your business, you cannot afford to waste a lot of time. Install processes and enforce regulations to curb any unnecessary downtime. The improvement of employee productivity is among the many duties of the HR department. You may want to look through as many HR templates as you like for ideas on how to do this. Alternatively, you can see the suggestions below and decide for yourself which ones you want to employ. With the goal of improving productivity, you’ll find just how well providing incentives work. There are multiple ways you can do this, including but not limited to: monetary rewards, gifts, free meals, movie tickets, and discount coupons. Asking for feedback is a great way to boost productivity. For one, it shows how much you value your employees’ input, which goes a long way in boosting morale. Second, you’ll get insight on how things are going and which areas can be improved upon. One reason why some employees aren’t as productive as they can be is because they may not have much responsibilities. Rather than allow them to do non-work related things, provide them with more tasks to keep them busy. 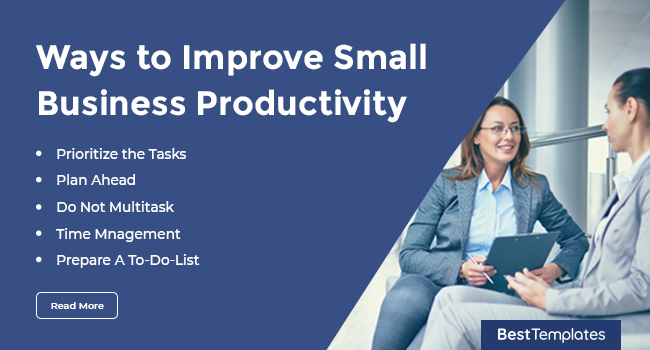 Productivity and efficiency tools will help employees keep everything together as they go about their tasks. Some of these tools include monitoring software or programs that enable them to accomplish work in easier, faster, and overall better ways. A set and rigid schedule isn’t something that everyone is comfortable with. Providing a more flexible schedule can allow some employees to relax and feel more comfortable. When employees are less stressed, they become more likely to put out their best work, ultimately leading towards greater productivity. The pressure to improve sales productivity can be immense. Many end up exacerbating the problem by pushing for more aggressive goals, yet they don’t work on everything else. As a result, productivity declines on a yearly basis. To counter this, here are solutions that you may want to look into. A skilled and dedicated team should be at the core of any plan you may come up with. Looking for the right people to fill your team won’t be an easy thing to accomplish, but it is necessary. Get this right and you won’t have to worry about any potential attitude problems or competency issues pulling your productivity down. Keep it as simple and as well-defined as possible. 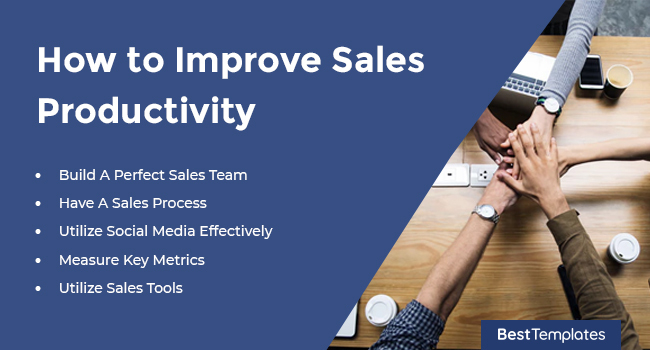 Having a sales process will not only lead to the successful management of your staff, but also a spike in their overall productivity. Start things off with the understanding of what your target customer’s buying process is. Follow that up with validated actions on their behalf, and always remember that complexity is not your friend here. Simple is how it should all go. It cannot be understated just how useful social media can be for sales. Neglecting this often means leaving money off the table. Note that even if you have your Facebook or Instagram accounts, failing to use them properly will do your productivity no good. Find better ways to connect and engage with customers as you use these platforms. In measuring key metrics, you can compare just how well you are doing in regard to your set business goals. This is something that will help boost productivity since you would be in a better position to decide where to go from there. Be sure to establish critical success factors and look into things like page views, keywords, and campaign data. Sales tools are here to ensure that you get things done in a much easier manner. Prominent examples include HubSpot, LinkedIn Sales Solutions, and InsideSales.com. Each one of these have their own features that are guaranteed to help you become more productive and successful in sales. Considering how cluttered the day to day lives of marketers are, finding ways to improve marketing productivity can be a remarkably strong challenge. Sure, marketing templates are there to help you out, but there are more things out there that can ensure success for this goal. Below are a few tips that you may want to look into. They are not the easiest to pull off, but if you succeed, you can bet that your productivity would be soaring. The best way to improve productivity is to set goals. Be sure to take the SMART approach to this; each goal should be simple, measurable, realistic, and timely. Doing things like that leaves room for considerable planning and strategizing, which all contribute to greater productivity. One thing that leads to unproductivity is the inability to target your chosen market. Make sure you know who you are doing everything for. Once you’ve cleared this up, your productivity should rise just by the fact that you are on the right track. A strong social media presence is vital in today’s marketing world. It is best to develop one, if you haven’t already, as quick as you can so that you too can reap the benefits. A social media marketing proposal can be put forth so that the strategizing and planning of your campaigns can begin in earnest. Knowing how effective your marketing campaign is can lead to greater productivity, but first you need to measure its results. A simple way would be to track basic KPIs, so you could see just how well everything is going. Check each goal and determine who is responsible for the data collection and reporting. Be aware of the tools that can make your life and work a lot easier. Whatever you decide to use, ensure that it is collaborative, cloud-based, and easy to use. Working in teams mean needing something that is appropriate for that situation, hence collaborative. Speaking of teams, you’re not likely to be together all the time, so a cloud-based tool can help out in allowing people to collaborate from anywhere. Lastly, nobody enjoys complex tools. Those are counter-productive. Find something easy and you are good to go. 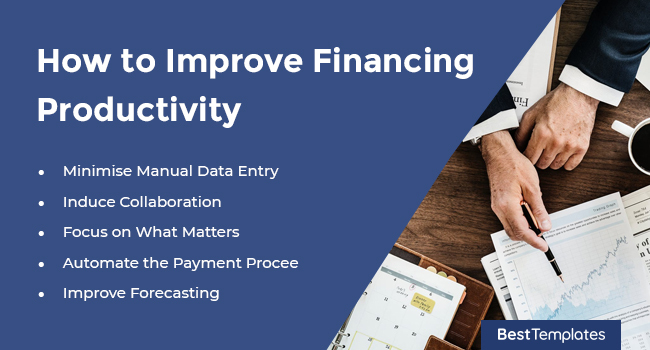 Improving your financial productivity can be a tricky thing to pull off. Beyond the finance templates that are no doubt incredibly useful, you’ll have to strategize boldly and maneuver away from the numerous pitfalls that come with the territory. Take a look at some of the listed ideas below and see if you can find a way to fit them into your plans. In minimizing manual data entry, you save a lot of time that could be otherwise spent on other things. Don’t be reluctant to spend on automation; after all, it exists to help make your work that much easier. Don’t allow collaboration to be just another buzzword. Start off with a clear-eyed assessment of how this can be done in your business. It helps to have a shared purpose, since being divided on goals will leave the entire attempt quite messy. Don’t leave useful tools on the shelf; make good use of what you have. Lastly, no collaboration attempt would be complete without feedback. Keep positive and criticize only constructively. This applies to any department in business. Ensure that your focus is on the most important matters. Take care when prioritizing one project or task over another. Careful analysis is much needed, so you’ll be able to stay on top of your plans and attain consistency in putting them into action. Part of what prevents you from reaching maximum productivity would be hurdles in the payment. Some customers may not pay on time or at all. Automating the payment process will not only solve this, but will also negate all those costly and ineffective billing methods of old. By its very nature, forecasting is inexact. The rule of thumb then would be to learn in which direction your forecasts can go wrong. From there, switch it into a picture of how well you are doing. That’s the trick to making improvements. When it comes to customer service productivity, you can choose to provide simple yet solid solutions, such as team empowerment, quality tools, and the simplification of your processes, among others. Planning and management templates are also quite useful when looking for boosts in productivity. Browse through the options below and decide for yourself. A lack of morale and empowerment can lead to low productivity. That said, there are ways to counter this. One method would be to provide generous boundaries. Listening to your employees is also a way of empowering them, as is praising effort. Do these, and you should successfully empower your employees and raise productivity levels in the process. This refers to ways of preventing any defects or mistakes in your products. It also refers to the avoidance of issues when you attempt to deliver solutions and services to your customers. QA comprises of both procedural and administrative activities, which are all implemented in quality systems that aim to fulfill requirements for products and services. Another reason why you may not be as productive is due to the fact that your approach to customer service is just too complex. The solution is simple: simplify it as much as you can without sacrificing the quality. Cut down on tools and consolidate your needs to a few, easy to follow solutions. Also be sure to nurture your relationships and make it easy for your employees to connect with customers. 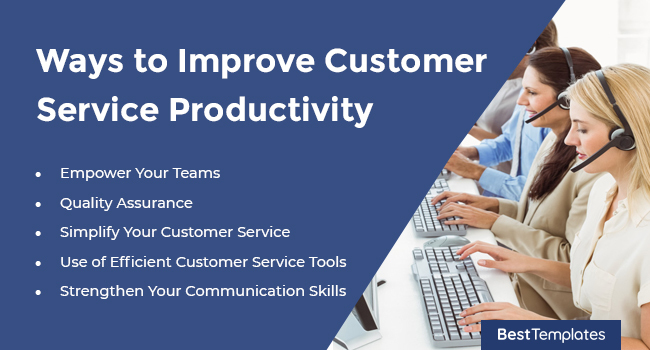 Choose the best customer service tools and you won’t see too many problems that arise out of productivity issues. There are many tools out there, but some of the best include: Zendesk, Freshdesk, Groove, Help Scout, Kayako, Deskero, and LiveChat. Whether you work in customer services or not, communication skills will come in handy regardless. However, this is particularly useful when dealing with customers, so make it a point to improve on any areas where you may be a bit lacking. Once you accomplish that, you should see an increase in productivity. Productivity is something that can be improved in a myriad of ways, across different departments of businesses. The good thing about the suggestions and ideas above is that each one is quite doable and even flexible. You can implement them as you see fit. 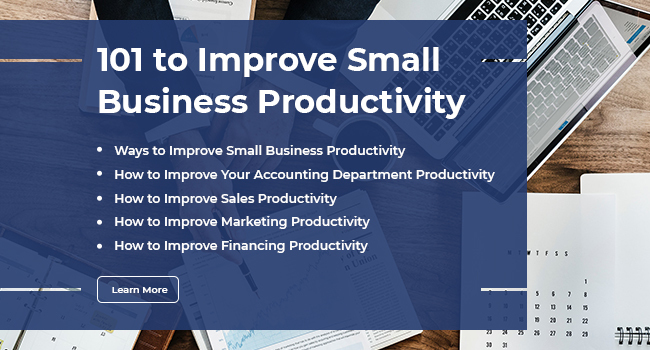 You can encounter around 100 questions for small business owners and it is guaranteed that by now, you would be able to handle anything that even remotely approaches the topic of productivity.